Apart from the wedding dress, the wedding cake is often considerably one of the biggest showstoppers during your special day. Whether you plan on wheeling it out in the middle of the dance floor for your guests to admire or you’d like it as the centerpiece of your wedding buffet, there’s no denying that the wedding cake plays an important role in your big day. The wedding cake can set the tone of your reception, as well as help tie together the overall look and feel of your wedding theme. While selecting the wedding cake can be an enjoyable and calorie-tastic experience (after all, you have to taste the cakes to see which one you like! ), the wedding cake can take a bite out of your overall budget. The type of cake you select can be particularly expensive, especially depending on the person or company you hire to provide you with the cake. If you’re having your wedding reception at a hotel or restaurant, you could have the establishment itself provide you with the cake. Many places are more than happy to do this, and it can even be included in the overall price package for the reception. However, this may limit your choice of cakes, which may not be an option for couples who want to find a unique show-stopping piece. You could also consider outsourcing your wedding cake needs to a local bakery in town. Bakeries are often a great choice for couples who are looking for a happy medium between cost and appearance. For example, you could find a beautiful wedding cake at your local bakery for less than what you’d have to pay at a hotel or restaurant. However, some couples may not like the additional task of dealing with another wedding vendor. Finally, you could opt to have your wedding cake needs fulfilled by a close friend or family member who has a knack for baking. This can save you a significant amount of money on the cost of your wedding, but be warned: if you don’t have a contract in place, it’s all too easy to end up with a disappointing cake (or no cake at all). Be sure to select a dependable friend who is more than happy to provide you with a wedding cake – and don’t forget to compensate them for their efforts! 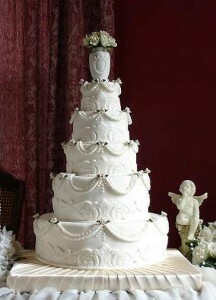 No matter which wedding cake option you pick, make sure you select a cake that’s a perfect fit with your reception.